Take your Sims to the city and explore everything it has to offer, from bustling action outside to unique situations that come only with apartment living. Fulfill your Sims’ dreams in the diverse city of San Myshuno, and discover new neighbourhoods and festivals. Experience the charm and challenges that come with your Sims’ first apartment, then work your way up the penthouse of your Sims’ dreams. • Explore the Bustling City of San Myshuno: Explore a densely populated, urban city with a variety of neighbourhoods each with its own unique personality. Paint (or deface) a mural in the Arts Quarter. Sing your heart out at the new Karaoke Bar in the Fashion District. Shoot hoops at the basketball court in the Spice Market. Invite friends over to play video games after a long day at the office in Uptown. • Discover Lively, Cultural Festivals:  Enrich and grow your Sims by taking them to different festivals all over the city where they can watch street performers, enter competitions, and meet different walks of life. 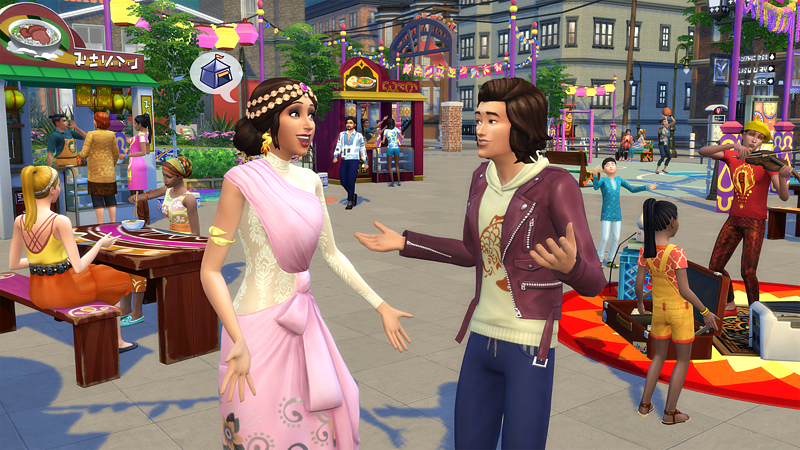 Take your Sims to the Spice Festival where they can enter the Curry Challenge and become the Spice Master. Help your Sim light fireworks with a hot date at the Romance Festival. Earn Simoleons by selling your Sims’ crafts at the Flea Market. • Live in Apartments and get Closer with Your Neighbours:  With so many Sims living in such close quarters, your Sims are sure to experience some interesting interactions, and build all kinds of relationships with their new neighbours. Maybe make a new best friend or romantic interest, and debate giving them a key to your Sims’ place. Or decide how you want to handle late night parties and blasting music. Beat them or join them? • Work Your Way Up from Starter Apartment to Penthouse: Choose an apartment that’s right for you, as each apartment has unique traits that will enhance your Sims gameplay. Experience the charm and thrill of your first apartment, but know that it might have some setbacks, like cockroaches, leaky pipes or electrical problems. 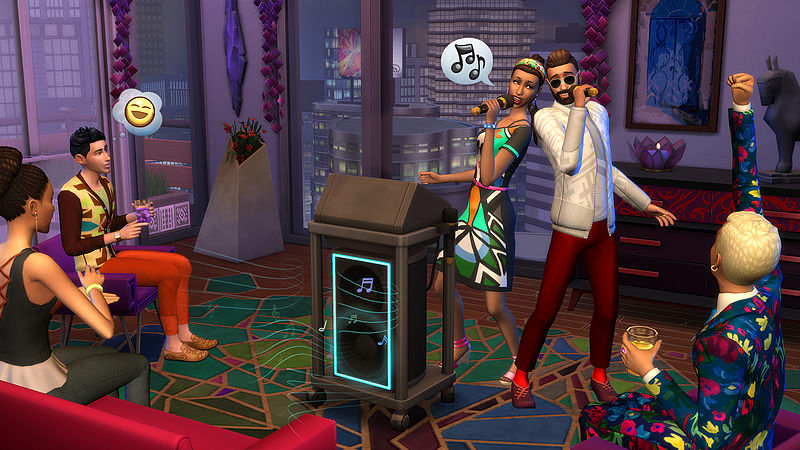 But remember that dreams do come true, and you can help your Sims’ work their way up to living in a Skyscraper Penthouse, with panoramic views and a… Talking Toilet! • Embark on New, Metropolitan Careers: Embark on new metropolitan careers and take your Sims to the city streets to put them to work! Make dramatic speeches as you fight for a cause as a Politician. Show the world how cultured you are as a Food or Art Critic. Inspire the masses and earn followers working in Social Media.